PDF Download - Barbara Baatz Hillman's Merry Christmas design is re-released in chart form. 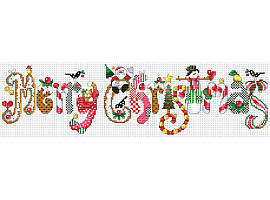 The whimsical design spells out Merry Christmas with holiday motifs imbedded in each letter. Rich in detail and color, this charming detailed design will be a cherished Christmas heirloom for generations to come. Contents: 225w x 60h in stitches. 16" x 4 1/4" on 14 count Aida.